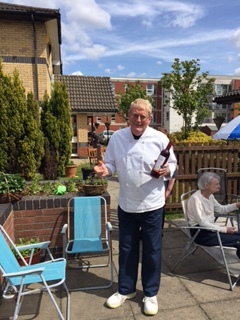 A Bupa Care Home has come up with an unusual tonic for residents – by providing them with their own traditional “pub and beer garden’’. Bupa’s Golfhill Care Home, in Glasgow, opened ‘The Dennistoun Arms’ as a concept to provide a recognisable social environment for residents to relive the past and encourage the sharing of memories and stories. Susan McDonald, Home Manager at Golfhill Care Home, said ‘The Dennistoun Arms’ is delivering a creative form of therapy for residents at the home. She said: “By providing The Dennistoun Arms (a mock pub), we have created a comfortable and familiar social setting for our residents which is a great way for them to relax. “While it is open to all residents, we have found it has a particular appeal to male residents, allowing them to reconnect with their traditional notion of ‘going for a pint with your pals’ and we hold many of the men’s clubs at the Dennistoun Arms. LOOKING FOR PR TO BOOST YOUR BUSINESS?